On this week’s Social Media Marketing Talk Show, we explore Twitter cracking down on bots and automation with Madalyn Sklar, Instagram DM replay changes, and other breaking social media marketing news of the week! If you’re new to the show, click on the green “Watch replay” button below and sign in or register to watch our latest episode from Friday, February 23, 2018. You can also listen to the show as an audio podcast, found on iTunes/Apple Podcast, Android, Google Play, Stitcher, and RSS. The Social Media Marketing Talk show will be taking a break for Social Media Marketing World 2018. Our next show will be on Friday, March 9, 2018. Twitter specifies that developers with apps or services that currently allow users to perform simultaneous actions across multiple accounts must make changes to bring them into compliance with this policy by March 23, 2018. Instagram Direct Adds New Replay Options: Instagram expanded the replay options for photos or videos sent from the Instagram Direct camera. Users can now choose to allow recipients to view the message once, replay it temporarily, or see a permanent thumbnail in the chat log with a recently released Keep in Chat option. Previously, all messages could be replayed temporarily but then would completely disappear. Snapchat Adds GIF Stickers for Stories and Rolls Out New Friends and Discover Screen Tabs: Snapchat rolled out the ability to add GIF stickers to stories. This new Snapchat feature mirrors Instagram’s GIF stickers, which rolled out last month. Giphy stickers are available on the Snapchat app for both iOS and Android and can be found along with existing text, stickers, and other editing options. The new format will allow for textures, lighting, and realistic rendering of rough or shiny objects and make it possible for developers to build seamless 3D sharing into any app. Facebook Messenger Simplifies Process for Adding Multiple People to Video or Voice Calling: Facebook Messenger rolled out a new Add Person feature that allows users to quickly and easily add more people to a one-on-one video or voice call on the platform. The ability to add more people to an in-progress video chat or voice call is available on both Android and iOS around the world with the latest version of Messenger. 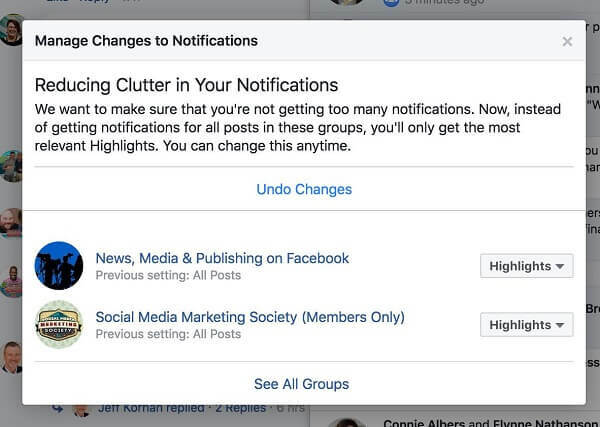 Facebook Limits Notifications From Active Groups: Facebook is “reducing clutter” in your notifications by limiting the number of alerts users receive from certain groups. Instead of getting notifications about every post shared within these groups, Facebook will now only send “the most relevant Highlights.” However, users can change this option at any time. This new feature was discovered by Mike Stelzner. Google Beta Tests AI-Powered Reply App: The Next Web reports that Google is beta testing a new AI-powered app that allows users to “reply to texts from various messaging apps by tapping on contextually meaningful replies right in your notifications.” The Reply app will likely be available on Android once it’s officially released, but Google hasn’t confirmed any details about its launch date. Facebook Signs New Music Licensing Deal With ICE Services: Following up on multiple music-licensing deals announced last month, Facebook reached an agreement for its first “multi-territorial” music license with online licensing processing and licensing solutions provider ICE Services. The ICE database contains approximately 31 million musical works that represent PRS for Music in the UK, STIM in Sweden, and GEMA in Germany. The deal with Facebook covers online music licensing for more than 290,000 rights holders in 160 territories across Facebook, Messenger, Instagram, and Oculus. Facebook Opens Registration for F8 Developer Conference: Facebook opened registration for its annual F8 developer conference, where the company showcases new technologies and tools, shares its goals for the future, and explores new ways to build community. F8 will be held in San Jose, California, on May 1 and 2, 2018. People must apply to attend in person, but anyone can sign up to see a live stream of the keynote or follow the conversation on Facebook and Twitter with the hashtag #F8. F8 on May 1-2, 2018: Save the date! F8, our biggest conference of the year, is happening at the McEnery Convention Center in San Jose, CA on May 1 and 2, 2018. Facebook’s annual developer conference showcases new technologies and tools and the amazing work of the developers who are using them. In addition to more than 50 sessions, attendees can experience interactive demos, have the opportunity to meet Facebook product experts and have the chance to interact with our global developer community. Visit www.f8.com for more information.